Ontology Engineering for and by the Masses: are we already there? This lab aims to get you familiar with the Protégé ontology editor and chosen OWL constructs. You are encouraged to continue developing and refining your ontology at home. As you follow the instructions, do all the tasks on your ontology started in WebProtégé or prepare the new one accordingly to the instructions. You will now have an empty ontology. Firstly, let's specify URI for our new ontology using menu Refactor → Change ontology IRI…, e.g. http://your-name/multimedia. This will be a prefix for all concepts that we will define in our ontology. Begin to create the primitive classes in your model. This begins with a couple of top-level concepts. Create the following tree by using the Create Subclass and Create Sibling Class buttons in the Asserted Hierarchy on Entities tab. Where required, add additional superclasses using the SubClass of button and the Class hierarchy tab. Notice that classes with multiple parents appear in several places in the asserted hierarchy. 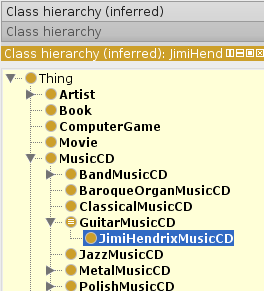 Create a RiversideBandMusicCD class as a subclass of BandMusicCD, PolishMusicCD and ProgressiveRockMusicCD ( create the class once, then choose the class, click on the SubClass of button in the class description, and choose appropriate classes from Class hierarchy tab). You should now have a small hierarchy of MusicCDs/Movies/Books. Add to these whenever you have a few minutes as they will allow you to create a larger ontology of multimedia later on. 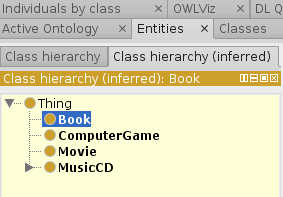 To make sure a Book cannot be a MusicCD at the same time, add disjoints into your primitive tree. Repeat this where appropriate, for each level of your ontology, selecting a class and making all of its siblings disjoint. If you get inconsistencies (some classes are highlighted red in the hierarchy), check what to do here. Take a screenshot of the inconsistent class hierarchy, see what is wrong with Explanation button and repair the ontology. Write in the report how you repaired it. Add more multimedia categories if you have time, making sure these are disjoint where necessary. In order to describe our classes we need properties, which are used to relate members of a class. We then add restrictions on the class to state logically how these properties are used. At this stage we are creating Primitive Classes, which only have Necessary Conditions (in this case, restrictions) on them – these are conditions that must be satisfied by all members of this class. In the left window choose containsMusicPerformedBy and in the right choose the Artist class. Make sure that Restriction Type is set to Some (existential). This means that for every MusicCD there exist an artist who performs the music in this MusicCD. Note that by default, restrictions are created as Necessary Conditions unless the Necessary & Sufficient heading is selected – for creating primitive classes, only create Necessary Conditions. 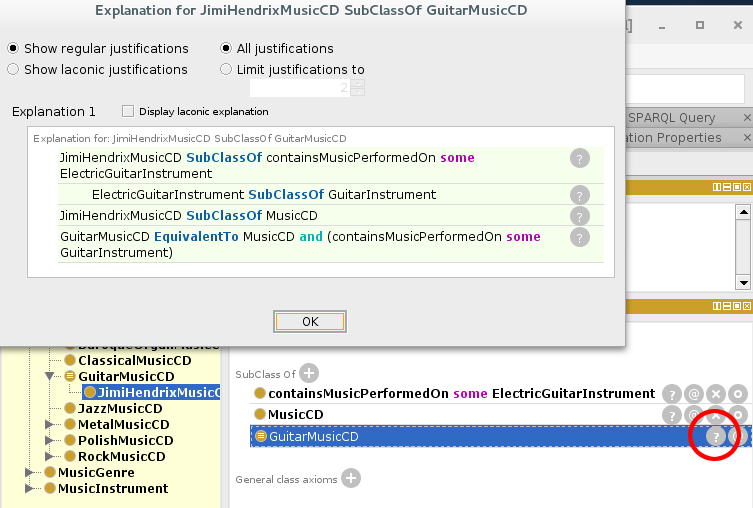 Create a class JimiHendrixMusicCD as a subclass of the MusicCD, define that it contains music performed on an electric guitar. Creating a defined class is similar to creating a primitive class, but a defined class has one or more Necessary & Sufficient Condition. Classes can easily be migrated between primitive and defined. We wish to model the statement: „Any MusicCD that contains music played on any kind of guitar is a GuitarMusicCD”. Create a restriction on GuitarMusicCD to state that it contains music performed on guitar. Select both conditions (the new restriction and the superclass, MusicCD) and in the context menu choose Convert selected rows to defined class. 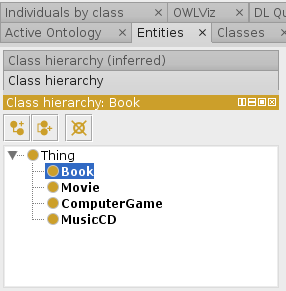 Classify your ontology (Synchronize the reasoner) and check in the Class hierarchy (inferred) to see what has been classified under the new class. 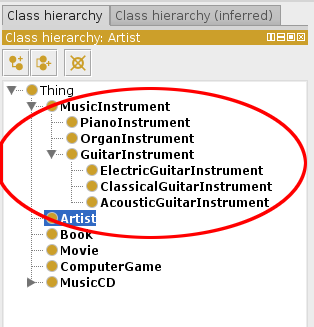 An Inferred Hierarchy panel appears: All MusicCDs that are set to contain music performed on any kind of guitar should now be subclasses of GuitarMusicCD. Click on the JimiHendrixMusicCD which should be classified as a GuitarMusicCD. Choose Explain inference question mark button and analyze the inference the reasoner did to classify the subclass relationship. If you have time, create several other defined classes of your choosing and classify each time to see if their definition has „captured” the correct named CDs. In order to define an ACappellaMusicCD, we are going to model the idea of a music performed without instruments. This class is going to be covered by all of the Music that are not InstrumentalMusic. GregorianChant, JewishCantillation, MuslimAnaseheed etc. are all to be classified as ACapellaMusic. Create the following subclasses of the Music class: GregorianChant, JewishCantillation, MuslimAnaseheed. In the expression editor that appears type a list of the Music you would like to be considered ACapella, separated by the union symbol (which can be added by typing „or” (lowercase). Classify your ontology – check that all the expected Music classes are now subsumed by ACapellaMusic. 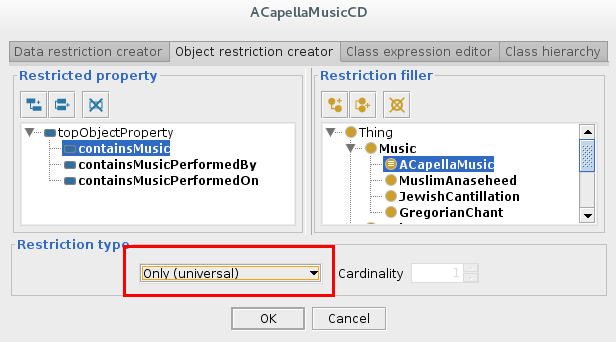 (With the Add button in SubClass of) create an Only (universal) restriction on this class along the containsMusic property with a filler of ACapellaMusic. 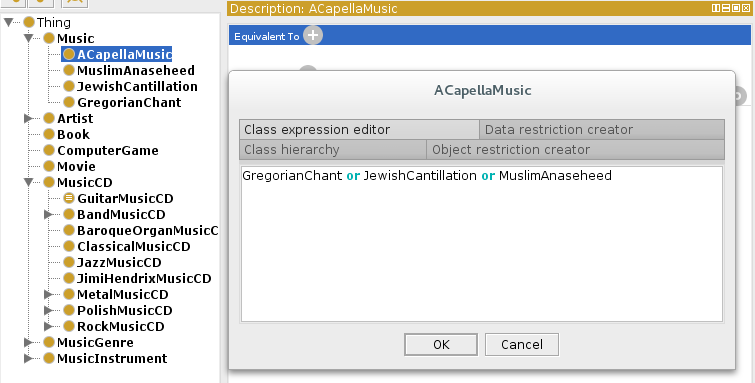 Create a ACapellaMixMusicCD as a subclass of the MusicCD. Add restrictions as in the picture: the CD should contain some GregorianChant, JewishCantillation and some MuslimAnasheed music. What happens? Do you get the expected results? Is the ACapellaMixMusicCD classified as an ACapellaMusicCD? Therefore, we need to close our MusicCD descriptions in order for them to classify correctly. 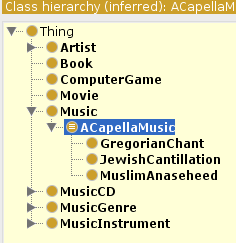 Classify your ontology to check if this class classifies under ACapellaMusicCD. If you have time, repeat the experiment for other classes. Create a publishedIn DataProperty in the Data Properties tab. Setting a domain on a property may lead to unexpected classifier results if the property is misused (eg if the domain has been over-constrained). Run the reasoner: what happens? why? Remove the disjoint axioms and run the reasoner again. What happens now? Take a screenshot of the inconsistent hierarchy and the explanation. Then solve the problem so both MusicCDs and Books can be published in the ontology. Finally, we will check our ontology against the most common pitfalls. We can do this using the OOPS! (OntOlogy Pitfall Scanner!). Run the OOPS! and fix your ontology accordingly to the guidelines. Send the report, the ontology file in Turtle syntax (File → Save as → Turtle) to your teacher. what are the ontologies for? what are the main components of an ontology? what is OWL and what sublanguages the are? what RDFS limitations does OWL overcome? What are the consequences of OWL being grouned in DL? What is Closed World Assumption, what Open World Assumption? Which is valid in OWL? 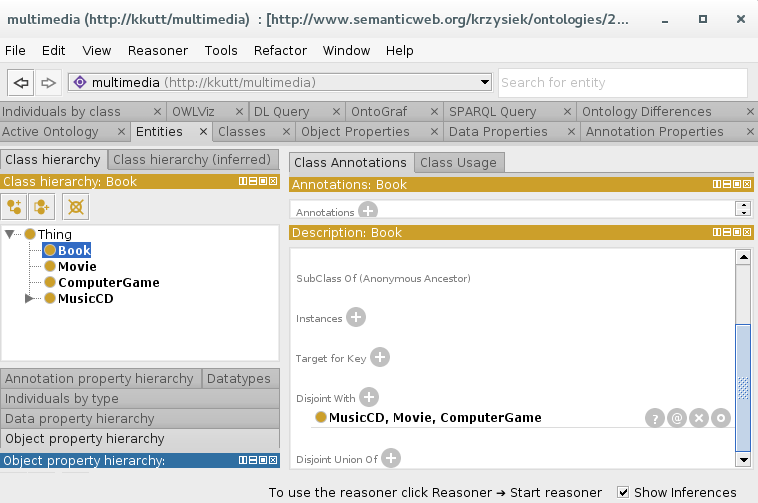 what are the reasoning tasks for a DL ontology?